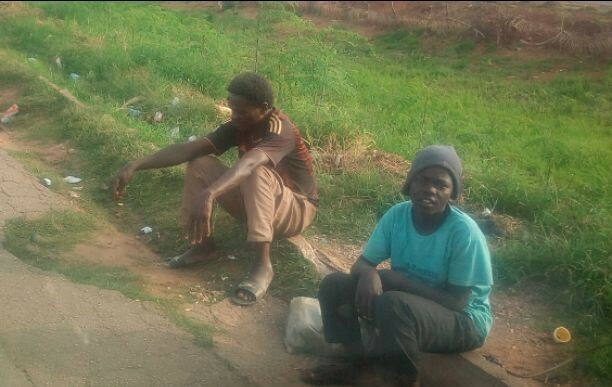 To people living in Kaduna especially those that ply Ahmadu Bello way through Kachia road to Command junction or Television garage daily, their knowledge of one 50-year-old man and his two sons who are always stand or sit by popular Danbo Bridge from morning till night, Monday through Saturday may not be far from their memory. But, what this family of three is doing on this particular spot remains a misery to many. This is because, they don’t move away from the same spot daily except when they change their standing or sitting positions. They don’t beg for alms too from commuters who board public transport here except few ones who are willing to give. Gobroadsheet visited the man in his station to unravel the misery behind their continuous presence and why the children were either not in school, learning a trade or acquiring skills that can make them better citizens. Though he was sounding incoherently during a chart with Saturday Sun, but he could speak well polished English language and accurate dates of events of his lifetime. They are not violent at all according to neighbours. The case of this 50-year-old man, who gave his name as Apostle Matthew Babangida and his 15-year-old son, James Isaac Cletus is worrisome and may become a serious security threat to the people resident in the state if nothing serious is done in good time. One of the boys was no longer there with his father and the second one was so bond with him that he could not run away. Nigerians who remember the story of Clifford Orji in Lagos few years ago may have idea of what this development may turn out to be. Efforts to trace his background failed as he declined to give any candid information about his origin except that he claimed to be the first son of former Head of State, General Ibrahim Babangida [rtd]. He spoke with Saturday Sun after serious persuasion and here are his words; “we are here not because we want to be here. This boy was in primary school here in Kawo. They just drove him with evil spirit from class. Sometimes he would look emaciated only for me to discover that he was sacrificed. And it is not only him other children in the school were affected. They were confused and were fighting all the time. So, he could not continue his studies under such condition. “I attended Rimi College, opposite KASU between 1976 and 1981 then I worked with my father in his business. I gained admission into Kaduna Polytechnic in 1983 where I study Electronic and Communication Engineering and graduated in 1987. “I have two boys, my children here with me, this one and his elder brother. The second one is not here now; he’s with my mother in Abuja. They almost kill him while some people pretended to be police came here and that was why I did not want to talk to you because of that experience. “They just put him across the road and before I knew what was happening, he was half dead. In fact, they left him because they thought he was dead. But fortunately for him, a woman, came and took him away, treated him and took him to a traditional leader in Narayi before one of my pastors in my ministry went and pray for him and then took him to my mum. “You see this place [pointing towards a particular direction], that was where they did their evil. But having destroyed the place for security reason, we cannot move away from here because this was the same place that evil was done. My father in the Lord has to come and pray to cap it. Then after, he was attacked, his family were also attacked. The mum of these kids came, they sacrificed her. So the whole thing is terribly set up for years. It’s not even a problem for me, but these children and their mum. “They can’t hold me because I can pray but here is a child who doesn’t know anything and as long as they are holding them captive like this, I can’t do my work the way I should do it. Their mum almost runs mad but she’s recovering because she is a servant of God. She is presently in Edo State. It’s just for them to release this boy. There is nothing I have not done but all failed. “It’s not a matter of suspect, I know because one of my friends in primary school way back in 1976 and that was the last time we saw until year 2000 when we met again. I won’t mention his name. We don’t have anything in common. I don’t know anything about him but it has been sacrifice, sacrifice destruction destruction since that time. I have to face this. Now for him to lose these children he refused. “I have money but I can’t get access to it. Before now, I have worked with Lever Brothers between 1989 to early 1991. Also worked with a commercial school where I taught before I moved to African Development Insurance Company. “This boy supposes to be in Danbo International School across there. I bought two properties here, two duplexes so that my children can just work down to school so I can go and do my work and their mother doing same. But the same people double-crossed. They supposed to live with mama Danbo, the woman who owns the school. Now this property here was bought by my father, General Babangida, the same IBB you know. I am his first born. What am I doing here? Am I a madman? “This is a grandson to Queen Elizabeth. I don’t have anything to worry about. The issue is not about the money or education, no, its about the evil they did. The first school I put this boy in Kawo, I was paying N14, 000 per term don’t I have the money? I bought houses here with N14 million apart from other charges. Don’t I have money to take care of them? “The way forward is that, I want to be out of this place and I know the guys involved are hearing me. They better do what they suppose to do. I have people working with me. Some of them are outside of this country. Why should I be here? I have no business been here”, he restated. Meanwhile, residents of the state who claimed to know the man said, the man and his two boys were once sleeping under Television garage/Sabo bridge before they were drove away from there. But why he remains cleft to bridges remains another misery yet to be unraveled. Sector Commander, Federal Road Safety Corps (FRSC) RS1, Kaduna, Umar Ibrahim however said, the man was not a threat to security in the state based on his personal encounter with him and the filler he got from the state government. He was contacted because the FRSC staff quarters were just a stone throw from the bridge. “There was a time I was driving along that bridge when I saw him causing something like obstruction. Then I saw him with a child carrying a ‘Ghana must go’ bag and was wondering what could be happening since they are not beggars. “So I asked my driver to reverse. But after my encounter with him, I deduce something. I felt it was a matter of security threat to the state. “Thereafter, I wrote a short report about what I saw and sent to the state government. It was then they investigated and later said the man was not a threat security in the area and that was why I left them”, he said. A staff of Danbo International College, who preferred anonymity because he was not authorized to speak on behalf of the school said, the claim by Babangida about the school was purely on the proximity of the school to his area of abode.